Established in 1791, Knoxville quickly became the first capital of Tennessee in 1796. It served as a commercial center for mountain communities as well as a layover spot for travelers heading west. Population and commercial activity exploded in the 1850’s with the arrival of the railroad, and most of Knoxville’s downtown historic buildings that still exist today were built in those decades directly following the Civil War. Throughout the next hundred years, the Center City had its ups and downs; but by the end of the 20th century, empty storefronts were common and urban sprawl had left the Center City underutilized and poised for redevelopment. Starting in the year 2000, cooperation between city leaders and private developers led to the renovation of Market Square and a string of historic buildings on the 100 block of Gay Street. Mixed-use development was encouraged and these two areas served to spark a resurgence that spread throughout downtown over the next 15 years. Today the Center City is well on its way to a full recovery. Downtown, teeming with activity, has a well-balanced mix of residential, retail, and office space combined with a compact, walkable layout that makes for a great urban living experience and a true community feel. 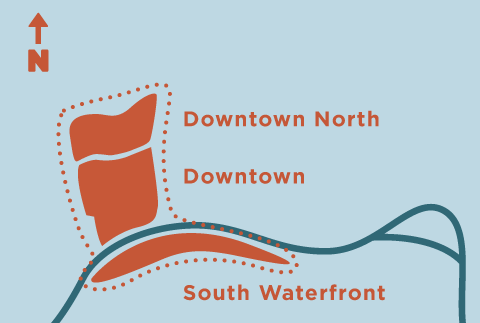 As unused space downtown becomes more difficult to come by, the resurgence is also spreading to the Downtown North and South Waterfront districts.